The official iOS App Store is packed to the brims with apps, so much that Apple is actually in the process of rewriting their search algorithms to allow better experiences on the store. Out of all the apps which Apple accept and allow on the store, some of the most popular offerings live within the Social Networking category. The WhatsApp mobile app is undoubtedly the most popular out of those, consistently sitting at the top of the download charts with over fifty million downloads. For those who may not know, WhatsApp is an advanced messaging platform that allows text, images, videos and audio notes to be sent to anyone else who is using the app, regardless of what platform they are using. Delicious Inc., the developers behind the extremely popular BiteSMS jailbreak package have recognized that WhatsApp needs a little bit of tweaking and have released a quick reply tweak that mimics some of the functional aesthetics that are found within BiteSMS. 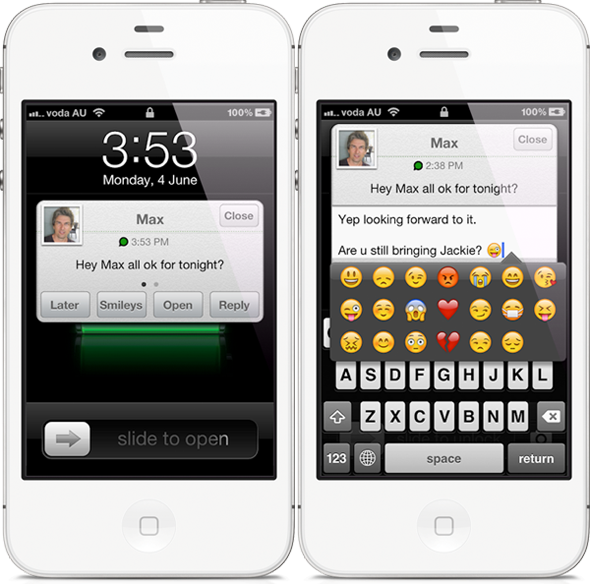 In a standard installation of WhatsApp, an incoming message will create a notification on the display, which when tapped will open up the relevant app and display the full body of text or content. Quick Reply for WhatsApp changes that default behavior by affording the user the ability to actually reply directly to the incoming message without ever leaving the home screen or whatever app they happen to be using at that specific time. One of the original appeals of BiteSMS was the quick reply abilities and is now being offered to the most popular chat app on iOS. Installation is simple, with no additional home screen icons being provided. All configurable options, such as displaying content of the message in a preview, is accessible through a new preferences panel in the native Settings app. The great thing about this package is that it offers its service from pretty much anywhere on the device, meaning that users can quick reply from the home screen, in another app or even from the lock screen without needing to open up the device and go into the app. 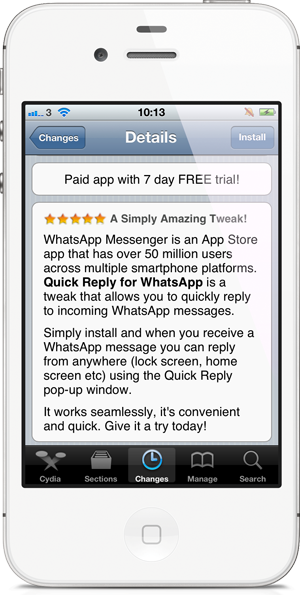 Quick Reply for WhatsApp is a commercial package that is available to download from the BigBoss repository with a seven day free of charge trial, allowing users to see if it meets their requirements before going ahead with the purchase. The package requires iOS 5 to be installed on the device and requires WhatsApp to be downloaded from the App Store.